Shanee Edwards, LA film critic who writes for SheKnows.com, has verified that she is going to the premiere of Captain Marvel. We’ll have Peetimes for Captain Marvel on Tuesday afternoon! Well ahead of its public release around the world. In addition, Dan Gardner (creator), Vera Tsien-Gardner (CEO RunPeeChina), and Jill Florio (co-creator) are also seeing the movie on Thursday night, March 7th. We will collaborate on the Peetimes to make them the best we can. UPDATE: Three collaborated and triple-checked Peetimes for Captain Marvel are posted on the RunPee app. We’re pretty happy with them. A lot happens in this film that you won’t want to miss. Overall all 3 Peetimes are pretty good. I would recommend the 1st Peetime over the others. It’s very easy to get caught up on what happened. The 3rd Peetime is almost as good, but includes a little humor. 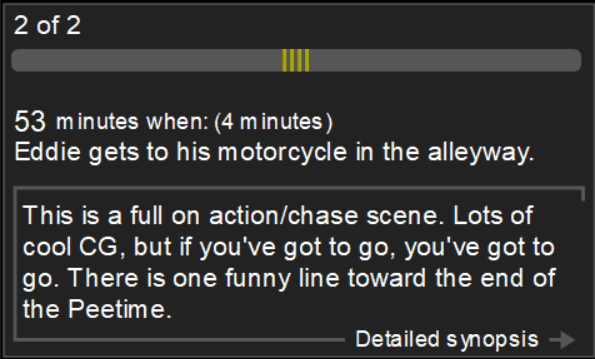 The 2nd Peetime is almost all dialog so it has a longer than average synopsis. There are two movies coming out this week about dogs. One is A Dog’s Way Home. The other is Replicas, which has no dogs in it, but it is a dog. It was strange that the CG for the computer displays — the 3D images seen when characters have the HUD on –were pretty snazzy, but then the robot CG was 15 years out of date. It was so jerky it looked like stop motion. The only good thing I can say about Replicas is that the credits are 11 minutes long, making this only a 95 minute movie. About The Peetimes: I have 2 Peetimes here. Both are fine, however, there is a crucial scene following the 2nd Peetime. The credits for this movie are 11 minutes long with no extras, so the movie is really only about 95 minutes. Contrary to what some might think, when the built-tin Timer vibrates, this isn’t the time to get up for the loo. The first rule for us in creating Peetime Cues is: don’t use a cue that’s a spoiler. For instance, we’d never have a spoiler like, “When Jack dies.” Because, duhhh. That much is obvious, but there are other spoilers that are easy to slip through. 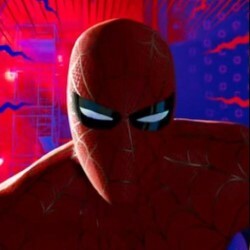 For example, in The Spiderverse movie I had a Cue that was dialog between Peter B Parker and Spiderman Noir. I couldn’t exactly put their names in the Cue, because some people may not be aware that there are multiple Spidermen in the movie. My favorite Cues are those that have simple, but memorable lines. There was a great one in Bumblebee: “I once stole a Mallomar.” That’s unique. That’s going to stick with you. Sometimes we have Cues that are visual events. Like in Mission Impossible: Rogue Nation, “When the SUV crashes into the river.” That’s distinctive, but a tiny bit of a spoiler, because if you read the Cues before the movie, you would know that the chase scene ends with the SUV taking a plunge. However, I was willing to overlook that, because that scene was also in the movie trailer. Sometimes we just make a judgement call like that, to give you a few extra moments to jump up and not miss the beginning of something important to come. It sounds like a good Cue and all, but the line is spoken very softly, and almost unnoticeable. I was listening for it and completely missed it. We’re always happiest when we have a Cue that is memorable and definitive. We don’t want our fans sitting in the theater wondering, “Was that the Cue?” When we’ve given you three or five minutes to go, we try to make this as easy as possible for you to know what to do. Makes sense? Let us know if we can improve! Are Peetimes just the boring bits of a movie? I can’t say this movie met my expectations. Unfortunately, my expectations were pretty high, based on early reviews by critics that this was the fresh new face of a new take on the Transformers. There’s a lot of good stuff in the movie. Most notably: Hailee Steinfeld as the lead character, Charlie Watson. She was a great choice for a tomboyish character who has gone through a traumatizing experience. She got as much out of her character as we could expect from any young actress. The faults I have are with the story, not her performance. What I liked the most about the story is that they kept it small. This isn’t the “grand epic, fate of the planet is at stake” sort of movie. It’s just one Autobot trying to survive against two Decepticons. What I disliked about the story is how forced it felt. There were numerous scenes that seemed crammed in just to have a payoff later, or even worse, provided no real substance to the movie. For instance, the mean girls subplot was a complete waste. It’s enough that Charlie recently lost her father. To add the minor subplot of the mean girls there to hurt her did nothing to build the story. My 6 year old niece was excited to see the movie with me. She watched attentively but seemed to get bored near the end. You can tell when a movie really grabs her, and this one didn’t. About The Peetimes: I have 3 nicely spaced Peetimes for this movie. I would recommend the middle one, because it’s fairly long and you can go over a little without getting lost. Only use the last Peetime if you think you can get back in 3 minutes. There’s an important scene that happens just as the Peetime ends. What does DC have to do to shake off the feeling that it’s the poor man’s Marvel? For starters: make better movies. I’m not saying Aquaman is bad. Far from it. It’s a decent movie despite being as predictable as it is visually appealing. But it’s no better than the first Thor movie. Which would be fine if Aquaman came out a decade ago. Unfortunately, Marvel beat them to the punch. DC is trying to find their feet while Marvel is breaking Olympic records. Here’s my best guess why Aquaman doesn’t soar: it just doesn’t know what it wants to be. It’s an origin story for sure, but not much of one. For such a long movie, the origin of Aquaman only comes up in a few brief flashbacks and only one of them — when he’s a young boy — really works. There’s a little romance, which is fine, but the timing of the scenes are completely wrong. Then there’s a few scenes that feel like they were stolen from a National Treasure sequel. The worst part of all of this is the inclusion of Black Manta. I don’t know why the writers felt compelled to throw this character into the story, because it only drags the plot beneath the waves. All of this happens in the middle third of the movie, robbing the plot of any real dramatic weight when it needs it the most. It looks like the creative decision makers behind the DC movies heard the criticism about their previous movies being too dark, and decided to “lighten things up a bit.” All I can say is it’s just not that easy. The audience needs a feeling of impending doom so the story grabs them, but there’s also a time and place for the distractions that make a story memorable. That’s why DC movies are like a mixed salad of moments while Marvel serves a complex meal, where each serving is meant to compliment the others. About The Peetimes: We have 4 good Peetimes. We recommend the 2nd and 3rd over the others. The 2nd Peetime is a chase scene — pretty — but nothing you haven’t seen in previous scenes. The 3rd is mostly a music montage, followed by a transitional plot that’s easy to summarize. I’m not a Harry Potter fan. Don’t get me wrong; I like the stories. I think they are rich and compelling. But I’ve never read the books — it’s on the list — and I personally wouldn’t bother seeing any of the movies on opening weekend if it wasn’t my job. I’m only setting the stage for where this review is coming from, because a movie review, or any review for that matter, isn’t about the thing being reviewed, it’s about the relationship between the writer and the object of the critique. If you share something in common with the reviewer, then perhaps you’ll share a similar relationship with the object of comment. Grindelwald is a great villain. He’s a freedom fighter. Not out for personal aggrandizement, at least not yet, but for the betterment of all. He’s only a villain because the Ministry — the centralized power — says he is. Honestly, if I were a wizard listening to him speak, I’d be on his side too. We’ll maybe not on his side, but definitely opposed to the Ministry. There are a LOT of characters and it’s hard to keep everyone, along with their relationships, straight. But it doesn’t help at all when so many lines are squashed under background noise or run over by music. Did the director/editors not listen to the dialog? Maybe they didn’t notice how unintelligible so many lines were because they were privy to the script, and just mentally filled in the auditory blanks. I was in a theater with state of the art Dolby sound and at least half a dozen times I had to wonder what on Earth a character said. I really wish I had rewatched the first Fantastic Beasts before seeing The Crimes of Grindelwald because I spent most of the movie lost trying to remember what exactly was going on in the character relationships: wait, she likes him, and he likes her, but something happened — I can’t remember what, and why are those two characters looking at each other like that? Is there something going on between them that… oh, right, now I remember… wait, no that was the other girl who… Screw it. I give up. 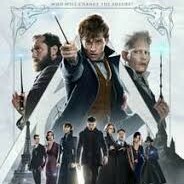 Just show some more fantastic beasts. So yeah, warm up for CoG by rewatching the first FB. If you saw the movie Bohemian Rhapsody, you got to see a remake of Queen at Live Aid. Here’s a video of the real event.